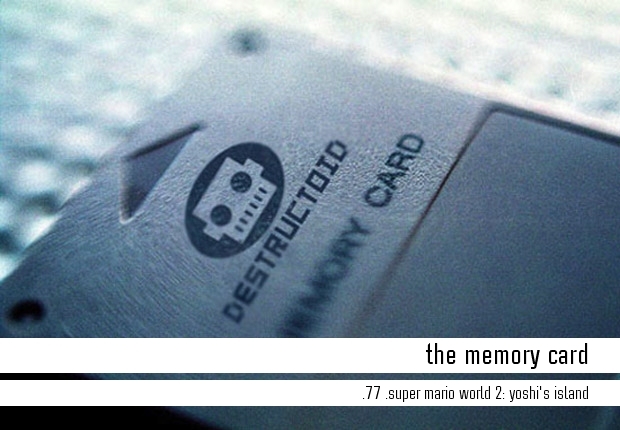 “The Memory Card” is a seasonal feature that dissects and honors some of the most artistic, innovative, and memorable videogame moments of all time. What makes a good boss battle? When you break it down, it’s not whether the boss is super challenging, has incredible graphics, or fills the entire screen. Sure, all of these aspects are very important, and, if used correctly, help make a boss battle successful and satisfying. What is most important, though, is creativity. Really, that’s all it takes. By presenting the player with something new and exciting, some boss battles have the power to soar above other standard fare and easily be the most memorable thing in a videogame. Because of this, a lot of the most creative boss battles are from the earlier era of videogames. Designers during the 8- and 16-bit generations could not necessarily fall back on impressive technology to mask the lack of creative design in their videogames. If a boss battle was poorly designed, it showed (see: every single moment in Total Recall). One of my favorite creative boss battles is from Super Nintendo classic (and the best 2D platformer ever, in my opinion) Super Mario World 2: Yoshi’s Island. It can be argued that every boss in Yoshi’s Island is memorable, but certain ones -- including this one! 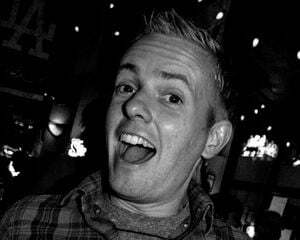 -- stand out as true examples of stellar game design. Hit the jump to revisit a fun little boss battle that is wildly creative, and just a little bit gross. 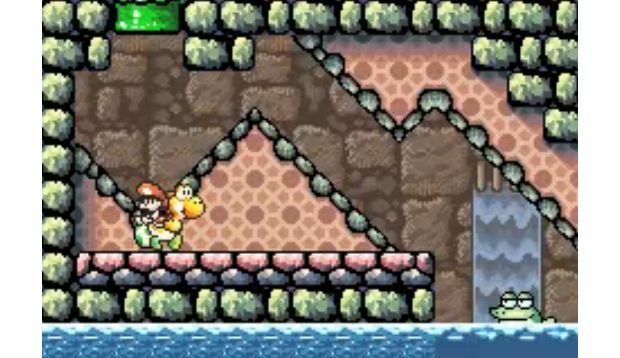 In a way, Super Mario World 2: Yoshi’s Island shares a lot in common with Super Mario Bros. 2 for the NES. 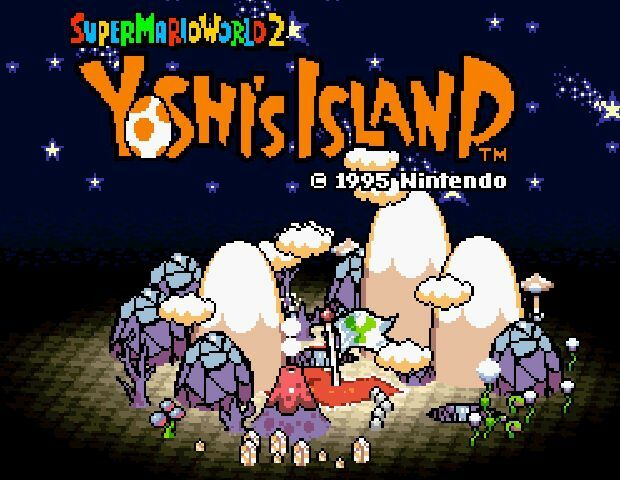 While Yoshi’s Island is a much better game, both sequels deviated a lot from their original games’ gameplay styles. In Super Mario Bros. 2, there were no bricks to break or princesses to save. 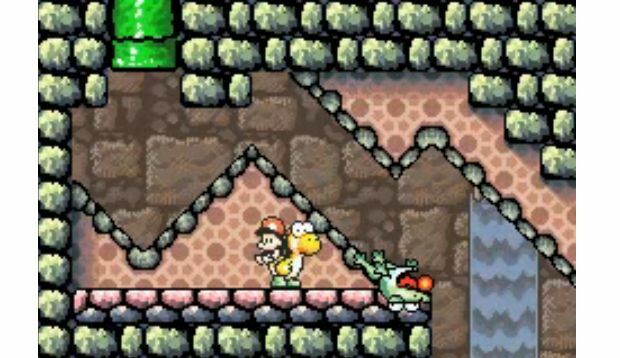 Similarly, with Yoshi’s Island, unlike in its predecessor Super Mario World, players controlled Yoshi as the main character, helping the loyal dinosaur carry Baby Mario through a massive adventure composed of brand new worlds. The side-scrolling, incredibly well-designed platforming may have stayed intact, but everything else about a traditional Mario game was turned upside-down (sometimes literally!). 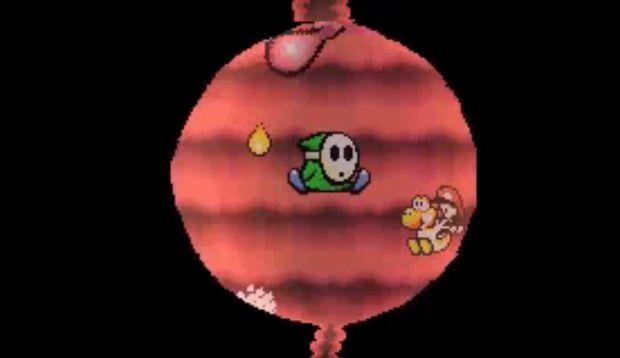 In the game, you play as multiple Yoshis -- they pass Baby Mario on like a baton over various stages -- as they journey through a series of levels to help Baby Mario locate his kidnapped brother Baby Luigi (one guess as to who the kidnapper turns out to be). 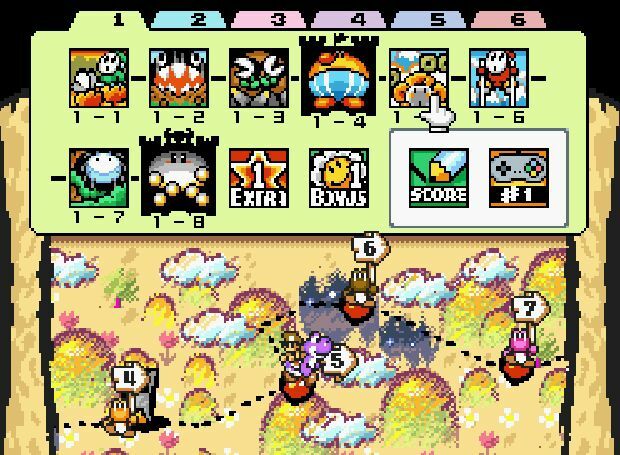 The level structure is even more linear than Super Mario World -- the world map is basically a list of levels, as opposed to an open-ish world with multiple paths. More specifically, a set pattern is established through the themed eight worlds. Within each world, there are eight levels: three “regular” stages followed by a fort, another three stages, and then a castle. In each of these forts and castles lies a boss, one of the most memorable things about Yoshi’s Island. I won’t get too distracted in my praise of the bosses in Yoshi’s Island, but each of the sixteen in the game is completely different, requires a different strategy, and displays some of the most creative design in the history of videogames. They each could have Memory Card moments of their own. As Yoshi and Baby Mario journey through the game, each boss they encounter is different than the last. And while most offer a significantly increased challenge, others are easier than you initially think. But that’s what makes Yoshi’s Island so great. If one boss has a lower challenge level, they usually overflow with so much creativity that it is a pleasure to battle them, no matter how tough (or not so tough) they turn out to be. That is the case with this week’s Memory Card moment: Prince Froggy. The boss is so fresh and memorable, you can easily forgive him for being a little bit of a pushover. After completing three stages in World 3, Yoshi and Baby Mario enter the world’s fort. Unlike the previous forts in the first two worlds, this fort is flooded by water, which significantly adds to the level’s challenge. 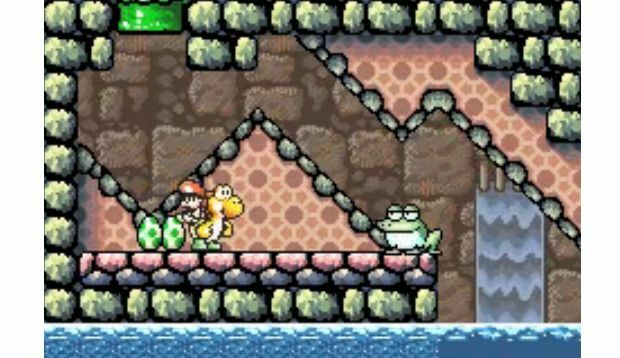 Yoshi and Baby Mario are tasked with jumping over deep pools full of water-spitting fishes and other deadly enemies, as well as navigating tricky moving platforms. Despite its challenge, like every other stage in the game, the World 3 fort is a joy to play through. Once they reach the end of the level, a large door stands in front of them. Not hesitating in the least, brave Yoshi and Baby Mario walk through the door and drop into a narrow green pipe. After sliding down the pipe’s interior, the pair emerges in a small room. On one side of the room is a stone wall. On the other is an open, shallow pool of water. As soon as Yoshi hits the floor of the room, a small set of eyes pops out of the pool. Before Yoshi and Baby Mario even have a chance to check out their new surroundings, the eyes leap from the water and reveal themselves to be connected to a puny frog. The sassy-looking frog plops down in front of Yoshi and smiles with a mysterious grin. At first the frog -- or Prince Froggy, as he is referred to in the game -- does not pose much of a threat. He is very small and could easily be swallowed if Yoshi ever felt the urge for a tasty, amphibious meal. But right when he jumps out of the water, Bowser’s cohort Kamek the Magikoopa flies in on his broom and surrounds Yoshi and Baby Mario with a rainbow-colored magic spell. Up to this point in the game, Kamek puts a spell on all the bosses and they quickly grow huge on the screen, towering over Yoshi and Baby Mario. This time, though, instead of the boss growing big, Yoshi and Baby Mario shrink to a ridiculously small size -- so small that it is hard to see them on the screen. Once they are done shrinking, Kamek flies away, just as Prince Froggy extends his tongue, grasping Yoshi and Baby Mario and swallowing them whole! At this point the screen switches to inside of Prince Froggy’s belly. It is a small, circular area with a tube extending out the bottom and a uvula wagging back and forth on the top (yeah, it’s not very biologically accurate). When Yoshi lands in the frog’s soft belly, its sides stretch and squish, showing off some of the cool graphics only possible on the Super Nintendo. With no eggs to assist him, Yoshi is helpless, trapped inside the stomach of a frog. Before long, though, Prince Froggy gets hungry and starts to eat random Shy Guys. 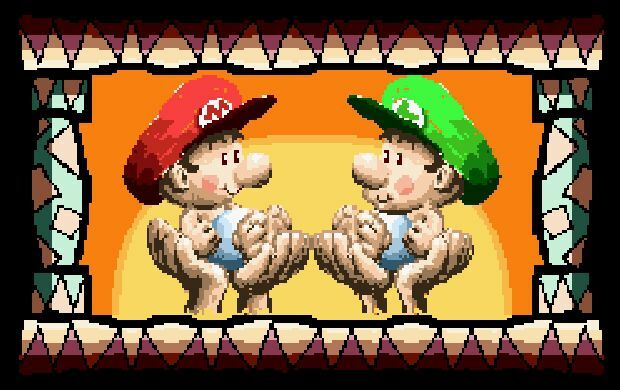 As they travel through his throat and into his stomach, Yoshi and Baby Mario must dodge them as they fall into the screen, all the while avoiding drops of stomach acid that also threaten to hurt the two heroes. It goes without saying that doing all this in such a small space is pretty tough. 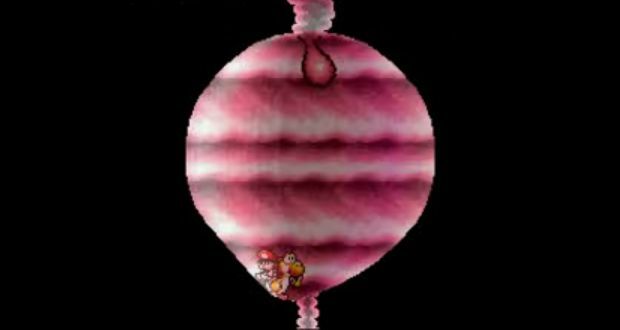 In order to defeat the slimy, icky boss, Yoshi must swallow the Shy Guys as they travel through the stomach, turn them into eggs, and hurl these newly-formed eggs at the hanging uvula above. After doing this a few times, Prince Froggy gets sick, expels Yoshi and Baby Mario (it is as gross as it sounds), and the pair grows back to normal size. 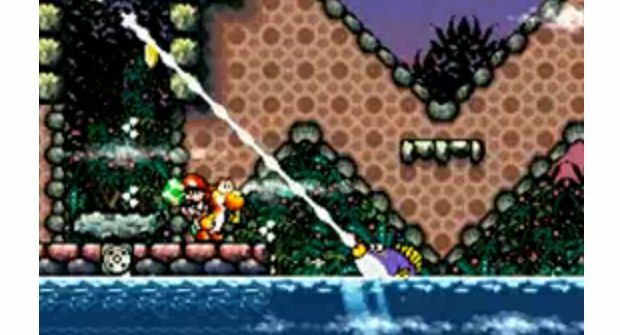 With a multi-colored explosion, the passed out and severely ill Prince Froggy flies back into the pool of water, leaving Yoshi and Baby Mario free to continue their journey to find the kidnapped baby Luigi. No other game on the Super Nintendo displays such a high level of creative design in such a consistent manner. No other. Sure, there are hundreds of great games on the Super Nintendo that I think are amazing (it is my favorite console of all time), but every beat, every enemy, every level, every sprite in Yoshi’s Island thrives with the kind of creative energy I go crazy for in videogames. Let’s break down exactly what makes the battle with Prince Froggy so wonderful. During the very first season of the Memory Card, I focused on my favorite boss battle from the entire 16-bit era of videogames: Raphael the Raven from this very same game. Just as with that classic battle, the encounter with Prince Froggy takes gameplay that is somewhat “traditional,” and places it in a completely original, unique setting, raising its creativity level several notches. Yoshi’s Island does such a nice job with the presentation of each of its bosses and surprising the player every time they meet one. To do this, the game utilizes Kamek to come in and change up the playing field before every single boss fight. 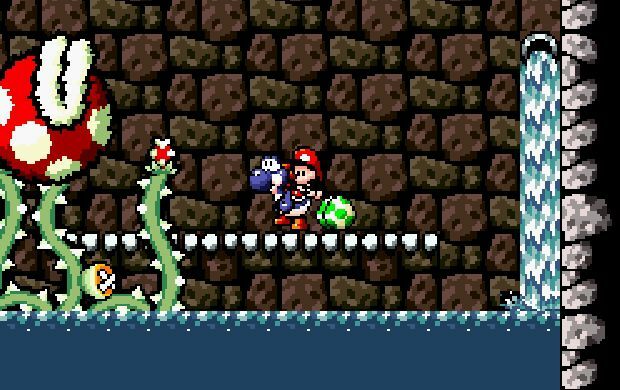 When Yoshi enters a boss room, a normal-sized enemy always faces him on the screen. When Kamek comes in and poisons the room with his brightly-colored spell, something unexpected happens. Usually this “unexpected” thing is the small enemy growing huge and forcing Yoshi and Baby Mario to figure out a new and creative way to defeat it, but, in the cases of Raphael and Raven and Prince Froggy, something even more unlikely occurs. With Raphael, Yoshi and Baby Mario soar to a beautifully-revolving moon, and with Prince Froggy, they are sucked into the belly of hungry frog. This sense of wonder and breathless adventure fills Yoshi’s Island and constantly makes you wonder what will happen next. And this wonderment is not relegated to just the bosses -- all the levels do it as well! Watch the video and again and notice the way the entire boss battle plays out. Each little sprite is imbued with so much personality and charm that each boss encounter in the game turns into a remarkable little mini-story, told with nothing but detailed visual touches. Yoshi drops in the room, Prince Froggy peeks out and jumps from the water (even the way his eyes are animated oozes personality), Kamek flies in, Yoshi and Baby Mario shrink, Prince Froggy eats them, the boss battle begins. Each beat may seem obvious and overly simple, but the highly detailed, stylized art gives life to everything. Now think about the actual battle. Even looking past the completely unique setting of a frog’s stomach and the inspired graphics that accompany it, the battle with Prince Froggy is impressive due to the designer’s numerous creative touches. In less talented hands, the battle may have playing out with Yoshi shooting random projectiles at the frog’s innards in the hopes of defeating him. In the game, Yoshi is required to use the Shy Guys that the Frog Prince is eating as his only weapon. Again, this all seems so simple and obvious, but that is one of the reasons the game is so exemplary. The lovely visuals, the brilliant creativity, the stunning design -- everything flows so seamlessly together that its genius is almost unnoticeable. If only every videogame could possess even half of Yoshi’s Island fun energy. Now, I know some of you think this is way too much praise to pour on a sequence that doesn’t necessarily stand out as being anything overly special. For me, though, the battle with Prince Froggy and, honestly, Yoshi’s Island in its entirety, are the perfect examples of everything I love about videogames. It all comes down to creativity. Pure, uncomplicated creativity. And this is something Yoshi’s Island has plenty of.